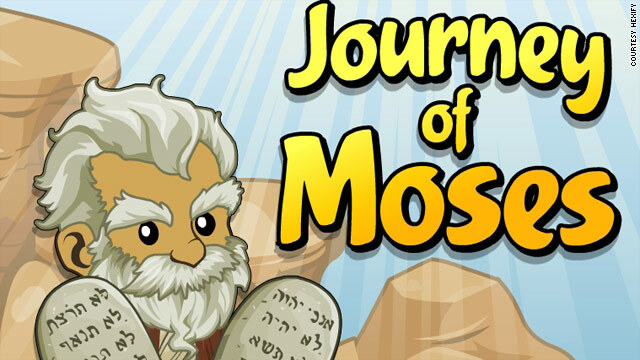 The Journey of Moses is the first biblically-based Facebook game. (CNN) - Moses is a cartoon with a big head, a small body and beady black button eyes with a spiky grey beard and spongy grey hair in a new game on Facebook. The art style is meant to reflect "the casual social game" that it is, says Brent Dusing, CEO of Hexify, creator of the first biblically based Facebook game, The Journey of Moses. "It's a fun, immersive, adventure game, so it's meant to be fun but respectful to the content and appropriate for the gravity of the story." Dusing says "300 million people play social games on Facebook." That's close to the population of the United States, so his target audience is "anyone from 13 to over 70 ... it's a timeless story that billions around the world know." At the beginning of the game, pharoah's daughter, reminiscent of a Cleopatra bobble-head, picks up a bundled baby Moses and cradles him in her arms. Moses is often portrayed as a great stutterer, timid of speaking in public, but in the game he is soon called a man schooled in all the wisdom of the Egyptians, molded into a Moses "powerful in speech and in action." "Moses starts out as the grandson essentially of the king of the world," Dusing said. From that starting point, any Facebook user who agrees to the terms of the application can invite friends to immerse themselves in a social game revolving around the life and journey of the religious figure. It's free, but users can purchase elements along the way to better their experience in the game. The Journey of Moses, like Facebook itself, is addictive, and advancement through the game, in which there is "no winning or losing," is contingent on social connections. "It's an adventure quest game," or a "map exploration game," Dusing said. "A little bit like Zelda merged with the Moses story - that kind of gameplay where you're exploring different areas and find different items and meet different people to propel the story." The small map expands exponentially as one gets further into the game. The player has to add friends to achieve certain things, thereby enabling Moses to pick up items otherwise locked to him in the game. The player must participate with friends as a collective to progress through certain parts of the story. Brent Dusing is a Christian, but Hexify is not a Christian company, and this is not its first foray into the lucrative sea of Facebook-style social adventure games. "It's been getting a very positive reception," he says, "with quite a few people playing it already." There are two ways to get to it, either via your App list or off the ad link in Journey of Jesus...sometimes the blank page appears one way but the other way loads. Sometimes it's just in a strop and won't load at all, bless it, so try again later! I love playing Journey of Moses, it's a wonderful game but it's not loading at all just a blank page for the last few days, can anyone tell me whats wrong?